WASHINGTON, D.C. -- Michigan Rep. John Conyers, under investigation over allegations he sexually harassed female staff members, said Sunday he will step aside as the top Democrat on the House Judiciary Committee while fiercely denying he acted inappropriately during his long tenure in Congress. In a statement, the 88-year-old lawmaker made clear he would prefer to keep his leadership role on the committee, which has wide jurisdiction over U.S. law enforcement, from civil rights and criminal justice to protections against sexual harassment. But Conyers acknowledged maintaining the position would be an undue distraction. "I have come to believe that my presence as ranking member on the committee would not serve these efforts while the Ethics Committee investigation is pending," he said. "I cannot in good conscience allow these charges to undermine my colleagues in the Democratic Caucus, and my friends on both sides of the aisle in the Judiciary Committee and the House of Representatives." Denying the allegations, Conyers urged members of Congress to allow "due process" before rendering a judgment. "I very much look forward to vindicating myself and my family," Conyers said. News website BuzzFeed reported last Monday that Conyers' office paid a woman more than $27,000 under a confidentiality agreement to settle a complaint in 2015 that she was fired from his Washington staff because she rejected his sexual advances. BuzzFeed also published affidavits from former staff members who said they had witnessed Conyers touching female staffers inappropriately - rubbing their legs and backs - or requesting sexual favors. 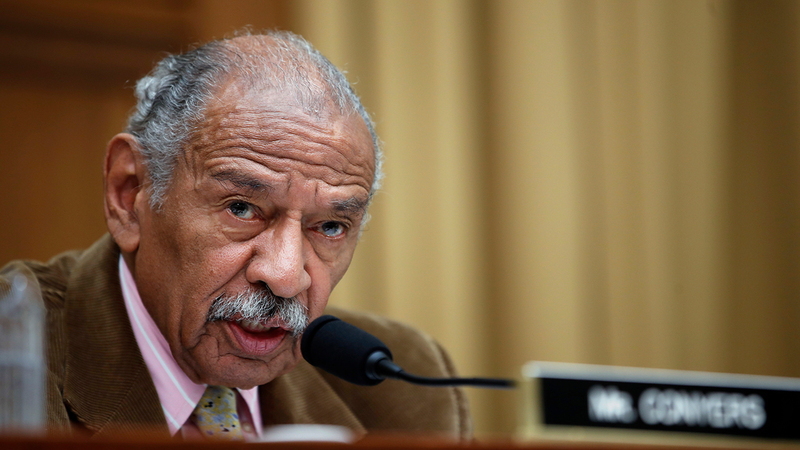 Conyers says he will fully cooperate with the committee, which said it will review the allegations of sexual harassment and age discrimination involving staff members as well as using "official resources for impermissible personal purposes." At least one House Democrat, Rep. Kathleen Rice of New York, has called on Conyers to step down. Two other Democrats, Rep. Gregory Meeks, D-N.Y., who is a member of the Congressional Black Caucus, as well as Rep. Raul Grijalva, D-Ariz., co-chairman of the largest group of congressional liberals, have said Conyers should step aside from his leadership role on the Judiciary committee. In a statement, House Democratic Leader Nancy Pelosi said she welcomed Conyers' decision to step down from his committee leadership post. "Zero tolerance means consequences," Pelosi said. "Any credible accusation must be reviewed by the Ethics Committee expeditiously. We are at a watershed moment on this issue, and no matter how great an individual's legacy, it is not a license for harassment. " She noted that the House in the coming week will vote on requiring anti-harassment and anti-discrimination training for all members and their staffs and suggested that non-disclosure agreements like the one Conyers signed to settle a 2015 complaint against him should be made public. "We must ensure the Congress has a climate of dignity and respect with zero tolerance for sexual harassment." It comes amid increasing attention on the issue of sexual harassment with multiple men in entertainment, media and politics facing allegations of misconduct. On the congressional level, Democratic Sen. Al Franken of Minnesota and Republican Alabama Senate candidate Roy Moore also are the subject of accusations. Earlier Sunday, Pelosi defended Conyers as an "icon" for women's rights and told NBC's "Meet the Press" that he will do the "right thing." Rep. Jackie Speier, D-Calif., who sponsored legislation to overhaul the system by which sexual complaints are made and settled on Capitol Hill, agreed that Congress needs to show a greater commitment to addressing sexual misconduct. Last month, she shared her own story of being sexually assaulted by a high-level aide while she was a staffer.